The 24-year-old has departed the Reds for Craven Cottage, bringing his four-and-a-half-year spell with the club to an end. Markovic originally arrived at Anfield from Benfica in July 2014 and has since made 34 appearances for the first team, scoring three goals. The forward has also spent time on loan at Fenerbahce, Sporting CP, Hull City and Anderlecht. Everyone at LFC wishes Lazar all the best at his new club. The Club is delighted to confirm the free transfer signing of 24-year-old winger Lazar Markovic from Liverpool on a deal until the end of the season. Fulham received very good recommendations from Aleksandar Mitrović regarding the player. Markovic made his breakthrough at Partizan Belgrade where he was a teammate of Mitrović and named in the SuperLiga team of the season in each of his two full – and title-winning – campaigns in the first team. His form attracted the attentions of Benfica in the summer of 2013 but he was only with the Portuguese giants for one season, as his extraordinary success in their treble-winning campaign prompted Liverpool to part with a reported £20m for his services. Markovic made 34 appearances for the Reds in his maiden campaign with the club, before taking in four loan spells across four different countries at Fenerbahce, Sporting Lisbon, Hull City and Anderlecht. Since making his Serbia debut in February 2012 Markovic has scored three goals in 22 outings for his country. Fulham completed the signing of winger Lazar Markovic from Liverpool late on transfer deadline day as striker Aboubakar Kamara left on loan. Markovic's move was confirmed almost 90 minutes after the window shut, with the submission of a deal sheet giving them more time to complete the deal, which runs until the end of the season. His move followed Hoffenheim midfielder Havard Nordtveit, who joined on loan. Kamara, meanwhile, has joined Turkish club Yeni Malatyaspor. The 23-year-old was arrested at Fulham's training ground 21 January on suspicion of actual bodily harm and criminal damage. Fulham said he had been "banned indefinitely from all club activities". He joined the club from SC Amiens in July 2017 and scored five goals in 15 appearances this season. Markovic, 24, had been at Liverpool since 2014 after signing from Benfica for £20m but made just 34 appearances for the Reds. The Serbia international spent much of his time at Anfield out on loan, having temporary spells at Fenerbahce, Sporting CP, Hull and Anderlecht. Fulham said they had "received received very good recommendations from Aleksandar Mitrovic" regarding Markovic. Norway international Nordtveit, meanwhile, has joined on a deal until the end of the season. The 28-year-old previously played in England for West Ham, making 21 appearances in 2016-17. "I'm really happy to have the opportunity to come back to the Premier League and hopefully help Fulham to a safe place," said Nordtveit. "That would be a something that I would put high on my list in my career." The Club is delighted to confirm the signing of Håvard Nordtveit on loan from TSG 1899 Hoffenheim until 30th June 2019. 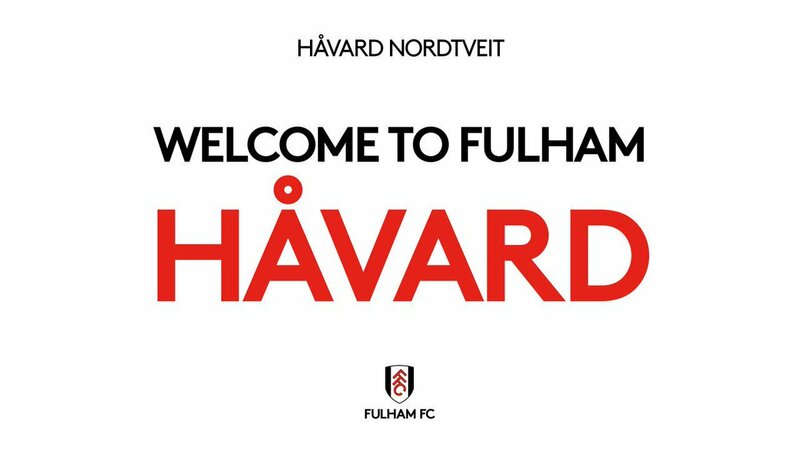 A versatile player who can operate at centre-back or in midfield, 28-year-old Nordtveit adds further Premier League experience to the Fulham squad, having spent a season with West Ham United. Nordtveit had his first taste of senior football in his native Norway in August 2006 when he became FK Haugesund’s youngest ever player at the age of 16. A year later – having been personally scouted by Arsene Wenger – Nordtveit joined Arsenal, and during four years as a Gunners player took in loan spells with UD Salamanca, Lillestr��m SK and FC Nürnberg.